A Pride & Prejudice & Zombies for lit lovers! Mr. Edward Dorchester invites several families of his acquaintance to a ball at his country estate, the night the Harvest moon rises fell and tainted. While those within are consumed by their hopes and schemes, tenants are going missing and arriving guests savagely attacked. 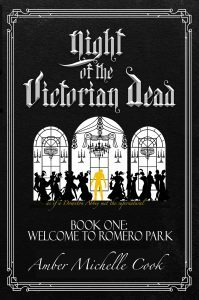 A gothic horror tale of classic zombies meets manners, with an ensemble, upstairs-downstairs cast of Vic. Lit inspired characters. The knowing modern reader can follow unsuspecting characters down the road to the inevitable. Amber Michele Cook writes stories of deep, meaningful fun. 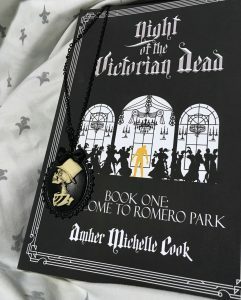 A devotee of Georgian to Edwardian period pieces, she adores Speculative Lit: Victorian literature-inspired works with a supernatural or paranormal element. Partly raised in Germany, she went to an international school for high-school, majored in linguistics, loves literature and period pieces. She’s also a photography/graphic arts artist of color and wonder living in the great Northwest. In addition to leading improv writing tables, she’s the Director of National Novel Editing Month and a Facilitator for the People’s Ink writing community. 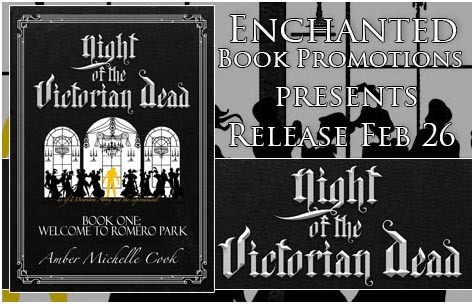 We’re hosting a giveaway for a Victorian brooch and signed copy of the book. All you need to enter is your email address!